Finally, this is what you have always been looking for. A complete set of accessories for your fine-dresser that is different from your average, gold or silver set with stone accents. This is wood at its finest, unrivaled in its unique, handmade quality. Each piece is unique from the next, ensuring that you will have your own sophisticated look. 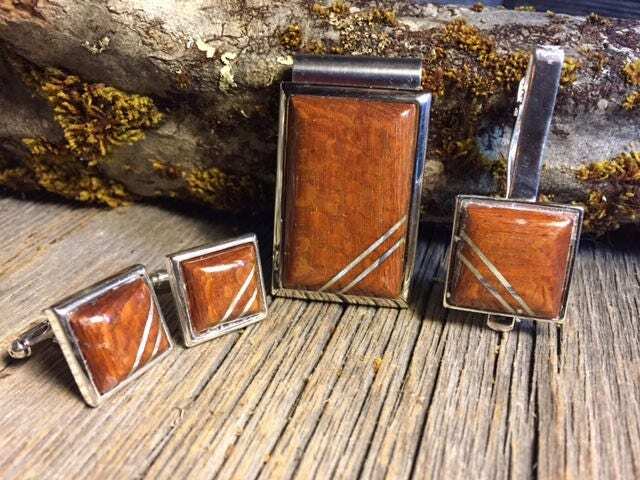 The Cufflink and Tie-clip pieces are made from a beautiful cut of Australian lace wood, set in Sterling Silver Plated Brass. 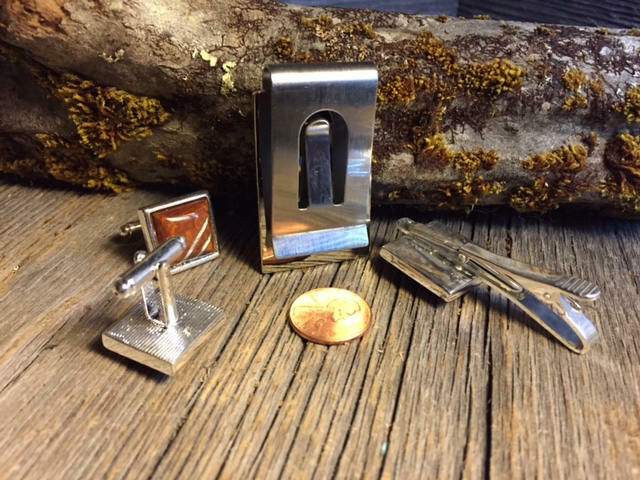 The Money Clip is made from top quality Chromed Steel, making it durable and rust-proof. Each piece is then masterfully adorned with 2 sterling silver inlay bands. The wood parts are finished with High Gloss Buffed Lacquer (HGBL) for a clear and natural look while giving the wood lasting protection for years to come, and protect the silver from oxidizing. **This complete set is available in Silvertone, only. Money Clip Dimensions: 2" (51 mm) x 1 1/8" ( 28 mm) x 1/2"
Tie clip dimensions: 13/16"x13/16" (20x20 mm) wood inlay, 7/8"x7/8" (22x22 mm) diameter. 2 1/8" (55 mm) overall length. Because this is a combo set, I can offer it at a reduced price, but any item can be purchased separately at the regular price through my store site. 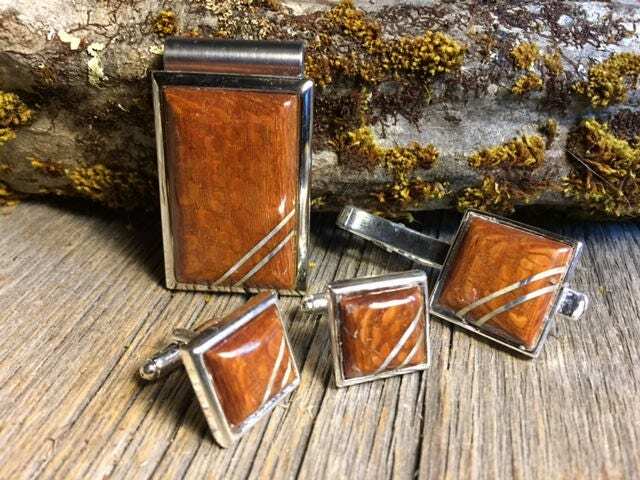 *This set is also available in other wood types that are used in my collection* Customizable work available, just contact me with any questions!